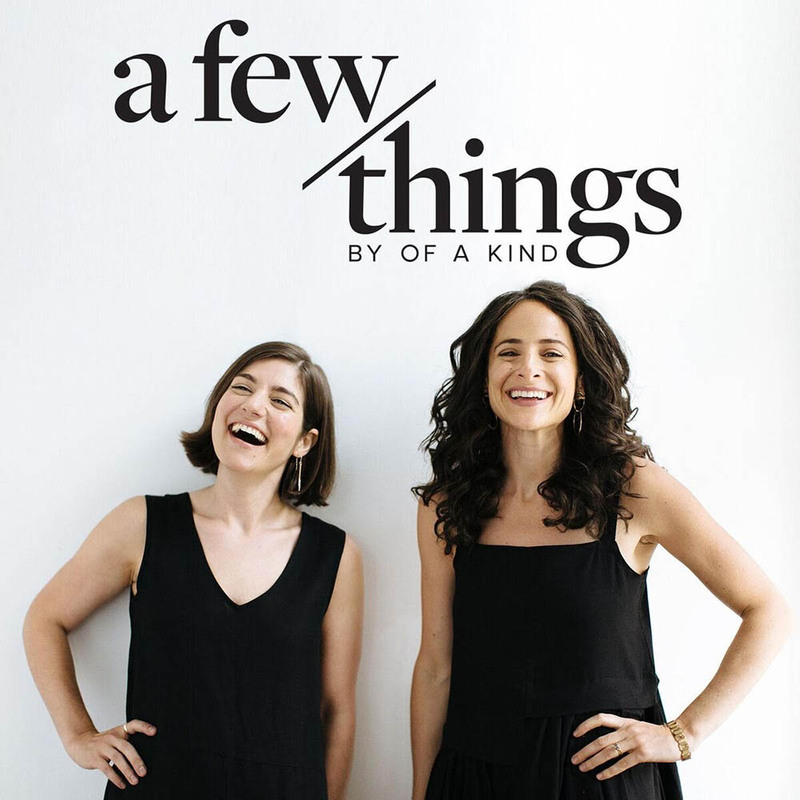 Co-founders of the emerging design site Of a Kind, expand upon the theme of their highly popular “10 Things” newsletter to share their latest and greatest discoveries. Each episode drills down into the nitty-gritty of two to four finds—covering topics across food, beauty, technology, literature, you name it—and often features a guest who has insider intel to contribute. 133: We Can’t Get Enough of Mary H.K. Choi, Author of Emergency ContactThis week on A Few Things, we’ve got Mary H.K. Choi, a.k.a. @choitotheworld, a.k.a. the brilliantly badass writer whose debut novel, Emergency Contact, is charming existing YA fans and converting new ones, both. 160: A Much-Needed and Extra Fun Best of 10 Things EpisodeThis week, Claire and Erica are bringing you another round of highlights from their weekly 10 Things newsletter. Read on for all sorts of easy and delicious ways to upgrade your life. Episode 148: A Very Snacky Best of 10 ThingsThis week, Claire and Erica’s last dispatch from L.A. is a real snack mix—with a couple of bonus Best of 10 Things nods thrown in for good measure. P.S. Word Notebooks will forever be an Of a Kind favorite, and you can snag a three-pack for 10% off with the code AFEWTHINGS. Episode 147: Wine Times with the Whiz Who Is Helen JohannesenThis week, fruit is front and center—first, Claire and Erica break down why and how they’re eating all the watermelon, and then it’s onto grapes with wine guru Helen Johannesen, the cutting-edge beverage director for the restaurants in the Jon & Vinny’s empire, the founder of Helen’s Wines, and a person we now desperately want to be friends with. Episode 146: What to Expect When Claire’s ExpectingSo, last week was a big one, and this week we’re doing a deeper dive into motherhood and pregnancy, talking all about Claire’s experience growing a human so far. Listen on for reading lists, shopping tips, and a least one toy that this fetus won’t be playing with for years but is probably already coveting. P.S. The best baby gift around are Estella’s squishy rattles, which we’ve got in hot sauce, hot dog, and avocado shapes, because you’ve gotta start ‘em young on all the best things in life. Episode 145: On Choosing —and Not Choosing—MotherhoodWe’re baaack. And we’re jumping right in with a topic that’s been much-requested by our listeners: parenthood! Claire and Erica share their own personal decisions, some recommended reading, and a little bit of news. (We missed you, too.) P.S. We’ve been generously swiping on the hydrating, brightening Olio e Osso balms ever since we got our hands on them, and you can do the same for 10% off with the code AFEWTHINGS. Episode 116: Talkin' Shop with the Founder of Ban.do, The Most Fun Brand This Side of the WebWe're highlighting some of our favorite past episodes! Original air date 1.8.18. If you properly appreciate the mood-boosting power of a fun phone case, you’ve probably come across Ban.do. The pop-culture-heavy accessories line is the brainchild of Jen Gotch, and she’s just as delightful, honest, and badass as the moniker mugs she sells. Episode 122: All the Books We Can’t Wait to Read and Listener Mailbag! We're highlighting some of our favorite past episodes! Originally aired 2.18.18. In this episode, Claire and Erica are responding to some particularly noteworthy messages they’ve gotten recently, and chat about all the amazing books they can’t wait to curl up with. Episode 103: Joe Holder, Trainer to the Stars (and Claire! ), on All Things ExerciseWe're revisiting some of our favorite episodes! In this one, originally aired 10.2.17, Joe Holder, aka @ochosystem, talks about why getting your head right is more important than getting your body tight. Episode 144: Glynnis MacNicol Has So Much to Say About Being a Woman in Her FortiesAfter Claire and Erica talk TSA, yogurt parfaits, and the intersection of the two, they have a chat with Glynnis MacNicol, whose new memoir No One Tells You This is about turning forty as a single women with no kids—and just how satisfying that can be. Sidenote: Let the eyes have it with Lily Lolo's all-natural mascara that stays put and makes your lashes look good as hell. It’s 10% off with the code AFEWTHINGS! Episode 143: Claire Wasserman on Doing Her Part to End the Wage Gap On this week’s episode, Claire and Erica have a topic hot off the garlic presses: whether or not those little kitchen devices actually work. And speaking of work, Claire Wasserman, the powerhouse founder of Ladies Get Paid, stops by to talk closing the pay gap, negotiating promotions, and what happens when women share their money stories. P.S. If you’re looking for some light in your life, Claire and Erica recommend the Hawkins candlesticks—which are 10% off with the code AFEWTHINGS! Episode 140: A Mixed Bag of Things We Can’t Put in 10 ThingsClaire and Erica are diving right in this week with the topic of showering at night. Is it worth the effort, really? That’s just the first of many groundbreaking topics covered this week, including crosswords and even more alternative mylks. P.S. Speaking of showers, it’s all about Shhhowercap showercaps, which look cute, will last forever, and are currently 10% of with the code AFEWTHINGS! Episode 139: We’re Reading Author Rumaan Alam Loud and ClearWe’re kicking off this week with an overdue (and not overly long) Alex update! Then! We’ve got the brilliantly insightful author and editor Rumaan Alam on the record about his second novel That Kind of Mother, which explores family, race, motherhood, and (to a lesser extent) Princess Diana. P.S. Who knew everything looks better with a touch of tortoiseshell? The designer behind Machete, that’s who—and you can snag all of her earrings for 10% off with the code AFEWTHINGS. Episode 138: Alex Capano Schools Us on Women's Health Issues and CannabinoidsOn this episode of A Few Things, Claire and Erica sit down with Alex Capano, DNP, CRNP, FNP-BC (tl;dr she knows her medicine!). You can just think of her as your friendly neighborhood expert on reproductive sexual medicine and cannabinoids. P.S. Speaking of health, if you didn’t put sunscreen on today, we’re not mad, just disappointed. Unsun Tinted Mineral Sunscreen is 10% off with the code AFEWTHINGS, so no more excuses, k? Episode 137: We TB with D C-T! Authors Joana Avillez and Molly YoungThis week on A Few Things, Claire and Erica chat with writer Molly Young and illustrator Joana Avillez about their new NYC-themed book of illustrated word puzzles, D C-T! It’s exactly as charming as they are. P.S. Code cherry red: The Megan Huntz Charlie Dress is your answer to anything that requires a pop of color, and it’s 10% off with the code AFEWTHINGS. Episode 136: Anthonia Akitunde on Showing Up for Moms of ColorThis week, Claire and Erica go deep with Anthonia Akitunde, the founder of Mater Mea, a website that shares stories of black motherhood. Take a listen and keep her in your sights—there’s a lot more where this convo came from. P.S. Add mancala to your list of things to do when phones are off the table. We’re playing Wolfum’s set, and it’s 10% off with the code AFEWTHINGS. Episode 135: Getting Bubbly with Sommelier Jordan Salcito You don’t have to pour a glass of wine to listen to this episode, but it would be appropriate: Claire and Erica are chatting with Jordan Salcito, Momofuku wine whiz, co-founder of Bellus Wines, and creator of Ramona, a very refreshing, canned take on a wine spritz. Get ready to drink up all her knowledge. P.S. Know what else is fresh? Being a better-smelling version of you. Escentric Molecule’s Molecule 01 Eau de Toilette gets you there, and it’s 10% off with the code AFEWTHINGS. Episode 134: A Super-Satisfying Installment of Best of 10 ThingsHungry for another Best of 10 Things? Prime recs comin’ right up! Claire’s living her best #taconight life, Erica’s got new bingeable TV, and—well, we don’t want to give too much away before you dive in. P.S. While you’re at it, get our most popular dress of the season while it’s hot and 10% off with the code AFEWTHINGS! Episode 133: We Can’t Get Enough of Mary H.K. Choi, Author of Emergency ContactThis week on A Few Things, we’ve got Mary H.K. Choi, a.k.a. @choitotheworld, a.k.a. the brilliantly badass writer whose debut novel, Emergency Contact, is charming existing YA fans and converting new ones, both. P.S. We’re gearing up for sunny weather in a major way with Carla Colour’s Lind and Barton shades. These bright sunnies are 10% off with the code AFEWTHINGS. Episode 132: Wake Up—It’s Time for Claire’s Morning Routine!Ready for the very fascinating rundown of how Claire gets revved up in the A.M.? You’ve come to the right place. In this ep, she makes a strong case for drinking coffee while lying down, taking a bunch o’ morning mirror selfies, and giving yourself plenty of time. Episode 131: Olivia Milch on Making the Movies We All DeserveFirst things first: Claire and Erica have quick updates on the competitive alpaca scene and the conclusion of The Great HDVB Shortage of 2018. Then—even more excitingly, if you can believe it—Olivia Milch joins us to talk about her first feature film Dude, which she wrote AND directed and that’s out on Netflix now. NBD. PSA: Co-ord w/ Permanent Collection by Of a Kind’s tank and midi. Snag ‘em for 10% off with the code AFEWTHINGS. Episode 130: Loads of Pro Tips from the Dynamic Interior-Design Duo of Jesse Parris-LambWhile we wait for the spring part of spring cleaning to kick in, Claire and Erica sat down to chat all things interior with fellow work wives and design gurus Amanda Jesse and Whitney Parris-Lamb, who are responsible for making Claire’s new place really feel like home. PSA: The way-chic Suede Circle Tote by Hopp is 10% off with the code AFEWTHINGS! High fives all around. Episode 129: Rise and Shine—It’s Erica’s Morning Routine!This week, Erica shows us how she gets up and at ‘em, and we wonder why this Alpaca Championship in her hometown of Peoria, Illinois, didn’t get as much coverage as March Madness. P.S. Definitely take a page from the alpacas and put your best face forward with Consonant’s DHE Clay Mask. Double win: It’s now 10% off with the code AFEWTHINGS. Episode 128: Fact-Checking with Misinformation Expert Rex Sorgatz!Call this the conspiracy-theory ep, if you like: After we revisit the oh-so-mysterious HDVB (Häagen-Dazs Vanilla Bean) shortage, we sit down with Rex Sorgatz, authority on all things hoax-y, misinformed, and just plain false. He literally wrote the book on them—it’s called The Encyclopedia of Misinformation, and it’s as intriguing as it sounds. P.S. Something that’s definitely true: Our amazing new Permanent Collection by Of a Kind duster is now 10% off with the code AFEWTHINGS. Episode 127: Dan Frommer on How to Score All the PointsClaire and Erica talk with Dan Frommer, creator of the Points Party newsletter, about which credit cards truly give you a bang for your buck. P.S. Don’t give up on dry shampoo just yet: La Tierra Sagrada’s smells great, absorbs fast, and is 10% off with the code AFEWTHINGS. Episode 126: Fake Ketchup and Real Celeb Talents on the Latest Best of 10 Things Ep! Episode 125: A Very Sudsy Body Wash v. Soap RoundtableOk, it’s time for the great soap and body wash debate of 2018, and we brought in two beauty pros, Britt Aboutaleb and Claire Carusillo, to work us into a lather. P.S. Vote with your dollars! If you want! Daughter of the Land Hair and Body Shampoo Bar, Rohr Remedy Honey Myrtle Body Wash, Modern Wash Soaps, and Wary Meyers Striped Glycerin and Confetti Soaps are all 10% off with the code AFEWTHINGS. Episode 124: Things You Can’t Say in 10 Things, Armie Hammer EditionOur weekly 10 Things newsletter (sign up for it here!) is dedicated to Claire and Erica’s latest finds—but every now and then, they want to talk about things that are less discoveries than obsessions. Like Palm Springs! Ever heard of it? How ‘bout Armie Hammer?? P.S. Upgrade your hostess gift game with these beautiful Areaware Totem Candles, why don’t you? They’re 10% off with the code AFEWTHINGS. Episode 123: Everything You Need to Know About Cannabis CultureToday we’re looking at the world through a green lens with Verena von Pfetten, co-creator of Gossamer, a lifestyle-slash-media brand for people who also smoke weed. P.S. Because you’ll definitely want some after listening to this episode, our best-selling CBD Rub (which comes in lavender and lemongrass) is 10% off with the code AFEWTHINGS. Episode 122: Listen Up: All the Books We Can’t Wait to Read and Listener Mailbag! One of the best things about doing this show is the very enthusiastic feedback we get from out listeners—and this week, Claire and Erica are responding to some particularly noteworthy messages they’ve gotten recently. We’re also chatting about all the amazing books coming out in 2018 that we can’t wait to curl up with. Let’s do this. P.S. The Outdoor Kit is filled with stuff that can make even the indoor kids among us want to hang outside. Get it for 10% with the code AFEWTHINGS. Episode 121: Katonya Breaux Is So Bright, We Gotta Wear SunscreenJust because you haven’t seen the sun in weeks doesn’t mean you don’t still need SPF, and Unsun founder Katonya Breaux is here to chat all about how she made an effective one that doesn’t leave skin of any hue looking chalky. (She’s also Frank Ocean’s mom, which isn’t super-relevant except as proof that badassery runs in the family.) P.S. We think the Dimes Cedar and Neroli Candle smells like Italy in the summertime, and it’s 10% off with the code AFEWTHINGS. Episode 120: Talkin’ Female Friendship with the Woman Who Wrote the (New!) Book on ItWe’re going deep on the history of shine theory with friend of the pod Kayleen Schaefer, author of the fan-freaking-tastic book Text Me When You Get Home: The Evolution and Triumph of Female Friendship. P.S. If you’re feeling warm and fuzzy about your BFF after listening to this ep, split these Merewif White Topaz BFF Necklaces with her—we’ll even give you 10% off with the code AFEWTHINGS. Episode 119: The Cream (and Sad Egg) of the 10 Things CropThis week, Claire and Erica ponder an age-old issue: When the heck is the right time to re-apply lipstick? From there, they move onto...more recent finds they can’t stop talking about. Speaking of, now’s the time to sign up for our 10 Things newsletter, which brings the party to your inbox every Monday. P.S. If you’re looking for a life-changing shampoo, Virtue Labs makes it. Oh, it’s also 10% off with the code AFEWTHINGS. Episode 118: We Stretch Our Yoga Knowledge with Sky Ting Founder Krissy JonesThis week’s ep is a real high-low mix that includes both an ode to Russian dressing and a very enlightening conversation with Sky Ting Yoga’s co-founder Krissy Jones. P.S. We’re taking our love of Maison Louis Marie No. 4 Bois de Balincourt Perfume Oil and rolling with it—you can get your own woodsy, obsession-worthy bottle for 10% off with the code AFEWTHINGS. Episode 117: Things We Can’t Put in 10 Things But Are 🤗 About StillLess than 60 days ‘til spring, kids! In the meantime, Claire and Erica are cozying up to the simpler things in life. And by simpler things, we mean stuff you maybe, probably already know about (but that is still so great that it’s worth talking about!). P.S. One way we’re keepin’ toasty over here is with Richer Poorer’s over-the-knee socks in black or tan, now 10% off with the code AFEWTHINGS. Episode 115: Wrapping Up 2017 on a Charitable Note—Here’s How We GiveHey-ho on this in-between week! We hope you’re listening to this with full hearts and stomachs, ideally surrounded by some of your favorite people. Something else we’re spending this late-December moment doing is thinking about end-of-year giving—a lot more on that in this episode. P.S. You know about our post-holiday sale, right? Get 30% off across the site with the code YEAROUT ‘til January 3rd! Episode 114: We Share Our Love of All the Indian Food Maya Kaimal Makes With the Woman HerselfWe take kitchen business (snacking very much included) seriously around here. Which is why we’re so stoked to have founder of Maya Kaimal Fine Indian Foods in our midst gettin’ saucy. P.S. Still struggling with a last-minute gift for, say, your mother-in-law? You can’t go wrong with our Rose Set, which you can snag for 10% off with the code AFEWTHINGS. Episode 113: Tune In and Tone Up—It’s Erica’s Fitness Routine!Do Chili’s fajitas and fitness go together? They do today! Claire and Erica share a major moment at a certain Southwestern chain restaurant before Erica breaks down how she manages to actually make it to workout sessions on time. Speaking of heavy lifting: the Professional Enthusiast Round 4 Weekender Bag is 10% off with the code AFEWTHINGS. Episode 112: Very Chill Party Ideas and So Much More in This Week’s Best of 10 Things EpisodeThis week, Claire’s stanning for stools, and Erica’s all about knife-and-fork salads. But that’s not all! Listen for their latest faves from our legendary 10 Things newsletter (you get that, right?!). Also, get 10% off the Tinted Mineral Sunscreen with the code AFEWTHINGS. Episode 111: Claire's Fitness Routine and Marathon Recap!We’re not sure if ya heard, but 50% of the hosts of this podcast rocked the NYC Marathon in November. So, how’d Claire Mazur tackle it? And why?! All her tips ahead—just keep pace. Episode 109: A Convo with the Cashmere Queen Behind Lingua Franca Um, have you seen our Professional Enthusiast Round 5 Cashmere Sweater?! We’re obsessed with it—and the woman we partnered with to bring it to life, Rachelle Hruska MacPherson of Lingua Franca. Episode 108: The Things Too Popular to Put in 10 Things—but That Are Still Worth Raving About! Episode 107: Getting a Read on the Executive Director of the National Book FoundationOur latest A Few Things episode is one for the books, thanks to some pre-Halloween planning (Ash the bunny is going as a bat, thanks for asking) and an extremely badass guest, Lisa Lucas, who runs the show at the National Book Foundation. Episode 106: What We Learned from Movin’ Out (and Up! )This week, we’re taking a page out of queen Cardi B’s book and makin’ moves—or, at least, recapping all the stuff we learned the hard way from our 2017 home and offices relocations. Episode 103: Joe Holder, Trainer to the Stars (and Claire! ), on All Things ExerciseSpecial and amazing guest Joe Holder, aka @ochosystem, on how why getting your head right is more important than getting your body tight. Episode 101: We're Back With Someone Whose Writing and Podcasting You Should Be TrackingClaire and Erica are back with special guest Fran Tirado! Episode 55: Grace Bonney and Julia Turshen on Their New Books—and Some Hostess Gifts, Too!Originally aired 9.12.2016. Episode 45: Talkin’ Biz with the BFF Co-Founders of Bed Bath & BeyondOriginally aired 7.5.2016. Episode 15: Ooh, Baby, Baby with special guest Joanna GoddardOriginally aired on 8.16.15. We chat baby gifts and running an insanely popular lifestyle website with Cup of Jo founder Joanna Goddard. Episode 100: The 100th Episode of A Few Things! Episode 99: #ReadingThings with Emily Danforth, Author of The Miseducation of Cameron Post! Episode 95: All The Reasons Why We Love Who? Weekly, with Co-Hosts Lindsey Weber and Bobby Finger! Episode 93: Dating Dilemmas and Cuttin’ a Rug (Literally) with Artemis Design Co. Episode 92: The Latest, Greatest, Tastiest 10 Things! Episode 91: #ReadingThings You’ve All Been Waiting For, Saint Mazie with Jami Attenberg!